Screws and their uses go back to the time of Archimedes and I sometimes wonder how the first screws were manufactured. My thoughts on the subject seem to generate more questions than answers. For instance, it seems as though the making of the first screw required a screw to serve as the “standard screw” for the process that produced the first screw. You get the idea. A lathe, in the old sense of the word, that is, before CNC lathes, generally has a “lead screw”, driven by a set of gears (“back gears”) connected to the lathe spindle. The “lead screw” rotated at an angular speed determined by the gear ratio of the “back gears”. The gear ratio is set by the lathe operator to produce threads of the required “pitch” (“threads per inch” for us old folks). A skilled lathe operator can produce many different types of threads to suit nearly all requirements. It is an ancient process still employed by The Old Machinist and his ilk. The thread, in the accompanying image, is being produced by the “single point” process, that is, by a single cutting tool. 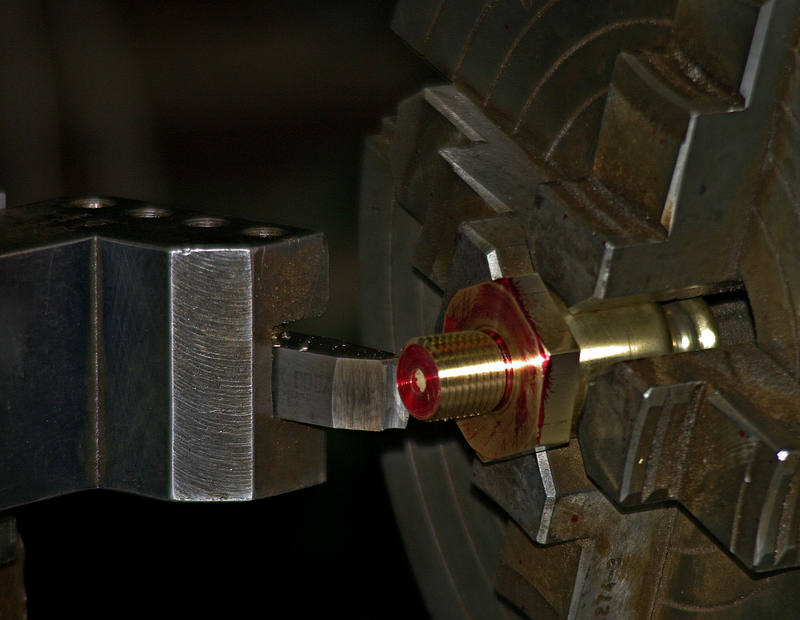 The tool is fed incrementally, over several cutting passes, into the workpiece at the angle set on the “compound slide”. The cutting edge of the tool “forms” one side of the thread and the other side is “generated” by the sequential advancement of the tool. Threading to a “shoulder”, as in the image, requires quick reflexes on the part of the operator and the ability to pay attention to what is happening. Otherwise, things get exciting quickly! If you come to visit as I am threading, you will be ignored until I am finished. Nothing personal – just don’t bother me when I’m threading.